PIETERMARITZBURG police have a serious shortage of manpower and vehicles, reducing their ability to combat and investigate crime. This was revealed by Police Minister Bheki Cele during a community engagement at the Caluza Sports Ground in Edendale on Tuesday. 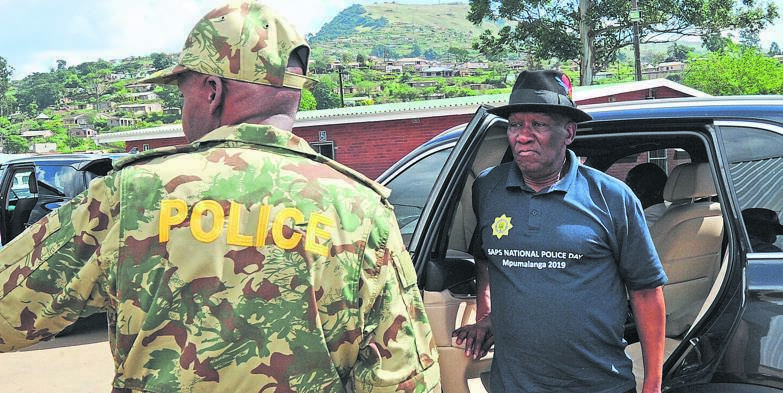 Cele, addressing dozens of residents, said police management in the province had discovered serious staff and resources shortages at most police stations in the city. He said KZN police management had also been inundated with complaints of incompetence at some police stations in Pietermaritzburg. In the coming weeks, Cele said, a national inspectorate and a human resources management team would be sent to Pietermaritzburg to quantify the numbers and compile a full report. With the visit, the police minister fulfilled a promise he made to the community last month to respond to their questions about crime in the area following the murder of traffic officer Sifiso Gwala. Gwala, of Imbali Unit 2, was shot and killed along with two of his friends, Nhlanhla Zibula and Nathi Zondi, on March 9. Cele said police records revealed that Dambuza and Mpumuza had the highest rate of murders in the city. “You have no mercy here. We have a high degree of murders … we don’t know why you kill each other,” he said. He said although there were complaints of incompetence at some police stations in the city, not all police officers were lazy. “Our prisons are almost 40% over-populated, which means that there are police officers who are doing their jobs,” he said. He implored the community to continue working with the police and report crime. Illegal taverns, police van shortages and the high use of drugs topped the list of complaints on policing matters raised by Pietermaritzburg residents. Phumla Gorge, a member of the community policing forum in France township, said although they were determined to fight the scourge of crime in their area, it was difficult without enough police assistance. “When we report crimes at Alexandra police station we are told there are no vans,” she said. Gorge pointed out that often they have to make the arrests and find ways to transport perpetrators to the police station themselves. The same concern was raised by residents from Richmond, Thornville, Elandskop and Plessislaer. Sabelo Mngadi from Edendale told Cele that they were concerned that police officers at the Plessislaer police station refused to open “common cases”. “We have had a string of cases that were reported at the Plessislaer police station but often people are told that those are common cases and that they should be resolved without involving the police,” said Mngadi. He and other residents said Pietermaritzburg needed additional police stations to service the growing population. “We can’t have one police station servicing a large area like Plessislaer,” agreed Nkuleko Bhengu. While a shortage of vans was highlighted, community members criticised some police officers for using state vehicles for frivolous activities like transporting their families to local malls.